The Developmental Stages Between Insect Moltings Are Known As? Astronauts Use What Inside Their Helmets To Scratch Their Noses? If the deep knowledge diving we do in pursuit of trivia has taught us anything, it’s that there’s a word for everything, and the period of rest between insect moltings is no exception. The process of molting in and of itself is an interesting and foreign one to mammals like us. We’re born one size and then we just stretch out, growing steadily from the day we’re born until we reach our maximum adult height (and then, typically, we do a pretty good job of stretching ourselves out laterally for the next few decades). That’s a little tougher when you’re an insect (or other type of arthropod) and your body is made of a tough exoskeleton that’s fixed in size. 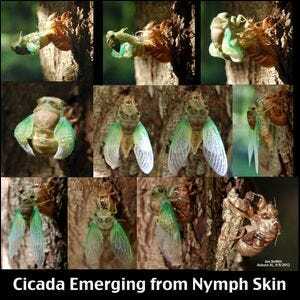 In such cases, insects have to molt, shedding their existing exoskeleton to emerge with a new one. The time between these moltings is known as an “instar”, derived from the Latin word for “form” or “likeness”. While some insects go through periods of molting and instars wherein they simply look like bigger versions of themselves (many caterpillars go through multiple moltings and instar periods and simply come out looking like bigger caterpillars), other times, such as with cicadas, the insect emerges radically changed. Image courtesy of Jim DeWitt.